I had seen the most iconic works by Diego Rivera in my Spanish textbooks, but I was unaware of the importance of Mexican Muralism as a whole. As a movement, it began in the 1920's with artists painting large murals loaded with political messages after the Mexican Revolution, and Diego Rivera was just one artist in this movement. I planned my day with three visits to see examples of Diego Rivera paintings in Mexico City. Alon,g the way I also fell in love with murals by other artists like Siqueiros and Orozco, in Bellas Artes. Here's a breakdown of the murals in Bellas Artes, and there are many!! Take your time to take them all in. There are also lots of great walking tours as well that include Bellas Artes. 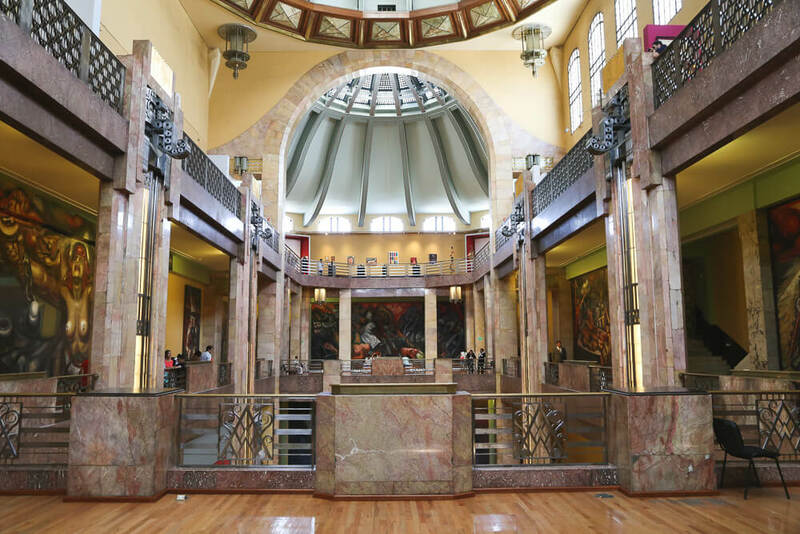 This full day tour includes the historic downtown, Diego Rivera paintings and Teotihuacan. 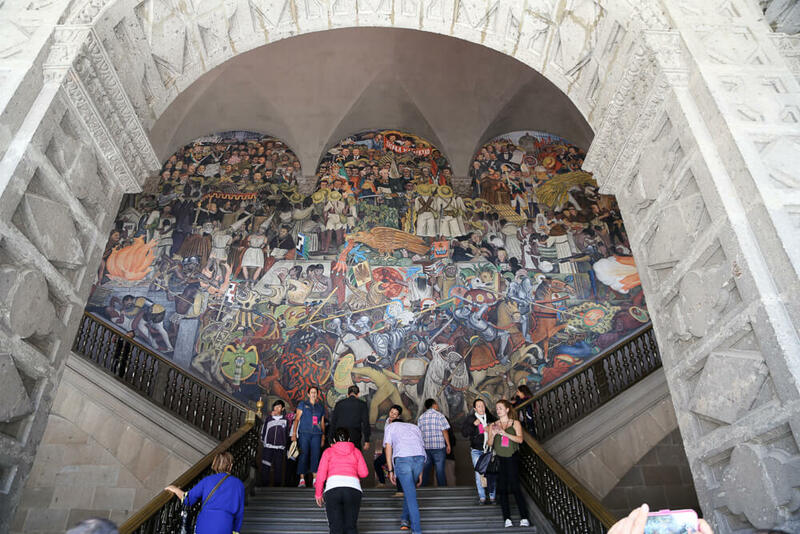 The upper floors of Bellas Artes are filled with murals, including masterpieces by the three most well-known artists of the genre: Diego Rivera, José Clemente Orozco, and David Alfaro Siqueiros. 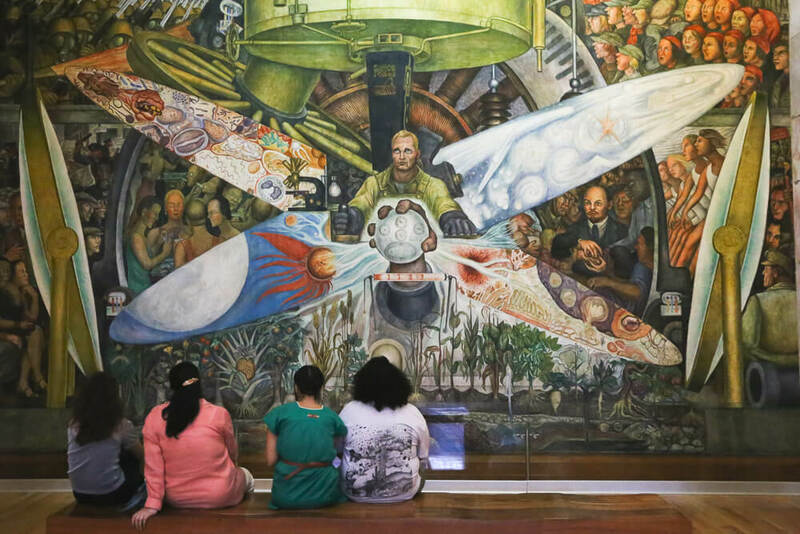 Man, Controller of the Universe, by Diego Rivera (above), is one of Diego Rivera's most famous works in the museum. It's a recreation of a painting (Man at the Crossroads) originally commissioned by the Rockefellers. The original was destroyed due to the depiction of communist leader Lenin. Using photographs of the original Rivera recreated this version in Mexico under a new title. The painting represents the replacement of superstition with science and the overthrow of the autocrats by the liberated working class. New Democracy by David Alfaro Siqueiros. The central figure here represents free humankind with both feminine and masculine traits, and also brings to mind the symbols of the French revolution. Torment of Cuauhtémoc, by David Alfaro Siqueiros. This is the painting that made me pause the longest, the sadness in Cuauhtémoc's eyes feels so real and the dog looks ready to jump out of the painting to attack the viewer. It represents when Cuauhtémoc was tortured to reveal the hidden treasures of Tenochtitlan. The woman died red behind him represents the nation itself, next to a smaller mutilated girl copying her posture. Carnival of Mexican Life, by Diego Rivera. The picture above only includes 3 of the 4 panels (my bad, one was behind a column). In the first panel, The Dictatorship, a giant that seems to be a combination of Hitler, Mussolini, Roosevelt and Hirohitoh holds a flag with the colors of Germany, Italy, Japan and the US. In the second panel, The Dance of the Huichilobos, the prehispanic god of war, Huitzilopochtli, is depicted with mestizo features and a Spanish uniform to allude to the violence of the Spanish conquest. In the third panel, Touristic and Folkloric Mexico, a group of people with donkey faces watch a group of dancers at the Festival of the Chinelos, mocking the Spanish conquistadors. Rivera painted these panels in 1936 but they were so politically controversial they were stored until 1963 when they were moved here to Bellas Artes. The fourth panel that I missed above is here on the left, the Legend of Agustín Lorenzo. This panel portrays the confrontation of the bandit/hero from the 19th century and the French troops in the War of French Intervention. On the right above is Liberation by Jorge González Camarena, it's a recreation of an earlier painting that was destroyed by an earthquake. The painting portrays slavery and shows various men casting their bindings off. Catharsis by Jose Clemente Orozco. This Mexican muralism painting is an overall critique of society, portraying general anarchy and social decay. Ok, I titled it how to see Where to see Diego Rivera in Mexico City and got carried away by all of the famous Mexican painters in Bellas Artes. Back we're back on track with Rivera at The Palacio Nacional, one of his most iconic works is here just off the Zocalo. The sheer size of the stairwell mural here will make you feel small as you stare up from below. Consider this great tour that will show you all the hidden secrets of Mexico City, including the National Palace. This Diego Rivera mural in the National Palace depicts the history of Mexico, with scenes pre-colonial Mexico on the right. The center portrays the Spanish conquest, both military and religious. On the left panel, the rise of the working class is depicted, of course with Frida Kahlo present among the people. On the upper floor, the Diego Rivera works continue, depicting life before the Spanish conquest. The paintings were intended to circle the entire floor but were never completed. Entry fee is 30 pesos, 5 additional pesos to take photos. The Diego Rivera Museum was created to hold just this one mural: Dream of a Sunday Afternoon in Alameda Park. On the far left is Hernan Cortes, with blood on his hands. Frida is in the center, with Diego Rivera painting himself a child sheltered right in front of her. There are elegant upper-class women flanking them, with a skeleton figure parodying their very look front and center. There's so much to take in that it's almost better that this is the only attraction in the Diego Rivera Museum. You can focus your attention solely on it. These three museums are all located in the Centro Historico in Mexico City. To see all three you'll spend under 10 dollars and have seen most of Diego Rivera's iconic works in the Mexican Muralism style! See Frida and Diego’s home in Coyoacan.